High-quality, accessible healthcare for all citizens is one of the most important pillars of the Cuban Revolution. Since the Revolution’s inception and throughout its development, the expansion and improvement of healthcare have remained among the government’s highest priorities and largest budgetary allowances. Before the Revolution, access to healthcare varied greatly by social class. Private clinics were only accessible to those with resources, and public hospitals were underfunded, inaccessible to most rural residents, badly equipped, and crippled by corruption. In 1961, the Cuban government created a new National Health System (SNS, for its acronym in Spanish) and began to phase out all private healthcare and expand public services. Today, all healthcare is regulated and financed by the government, and is provided to Cubans free of cost. To overcome limited access to pharmaceuticals, technology, and other material resources, the country has leveraged its strength in education and high number of trained doctors to focus on making primary care accessible and community-based. In this way, emphasis can be placed on prevention, and the need for costly “cures” is reduced. The result is remarkably strong health outcomes with very low spending: Cuba routinely outperforms all other countries in Latin America and the Caribbean in measures such as infant mortality and life expectancy. In fact, even while spending $6,928 (73.68%) less per capita on healthcare than the United States in 2014, Cuba recorded a 26% lower infant mortality rate and 0.7% higher life expectancy for that year. Cuba now faces the challenges of making care more comfortable in medical facilities that suffer from limited access to bedding, bandages, and other basic resources, as well as dealing with chronic diseases (such as cancer, diabetes, etc.) and those that affect the elderly (such as dementia). Despite these challenges, Cuba continues to defy the correlation seen in other countries between high levels of economic resources and strong indicators of public health. The Cuban healthcare system employs a three-tiered structure for organizing primary, secondary, and tertiary care. Municipal authorities oversee a community-based primary care level consisting of consultorios (first-level clinics for consultation with doctors and nurses) and regional polyclinics. This level is famously characterized by a general family-doctor-and-nurse model (MEF, for its acronym in Spanish), which is tasked with the lofty goal of improving the base level of health of the entire nation. Under the MEF model, every neighborhood is assigned a family doctor. These doctors are responsible for keeping track of every patient in the area; they determine who is healthy, who is sick, and who is at risk, as well as make rounds to ensure that everyone receives vaccines, prenatal care and other attention at the proper times. Consultorios serve as decentralized, front-line points of healthcare administration, and they strive to resolve around 80 percent of all cases. When patients require a higher degree of care or attention, they move up to the second level of healthcare, which includes provincially managed hospitals and centers of specialization to treat sick patients, handle complications, and encourage rehabilitation. Although patients are free to go directly to these institutions, the system works most smoothly when family doctors refer them and work in partnership with specialists. Approximately 15 percent of cases reach this level. Finally, the third level of healthcare includes nationally-administered, specialized hospitals and centers for the treatment and study of particular diseases. This level is the most curatively oriented of the three, and deals with patients who have complications from serious illnesses. Around 5 percent of cases are treated at this level. In addition to the three-tiered model of doctor-patient care, the SNS oversees a set of policies and practices geared toward prevention and public health. The Ministry of Public Health (MINSAP) oversees epidemiological control (such as regular fumigation to minimize mosquito-borne diseases); regulation of sanitation; promotion of hygienic norms in the population; care for the elderly and disabled; and regulation, evaluation, and control of both imported and domestically produced medicines. MINSAP also oversees institutes and state businesses that investigate and fabricate vaccines and pharmaceuticals. Largely because the trade blockade has limited Cuba’s access to many imported medicines, Cuba has developed an innovative domestic biopharmaceutical and biotechnological sector. Cuba’s domestic production of medicines reduces the cost of importing the medicines from other countries, and additionally, exporting medicines supplied Cuba with some $686 million USD in income in 2013. Overall, Cuba’s SNS stresses the holistic nature of health and well-being, treating the patient as a “biopsychosocial” entity, with biological, psychological, community-based, and social forces all intersecting to determine the individual’s health status. 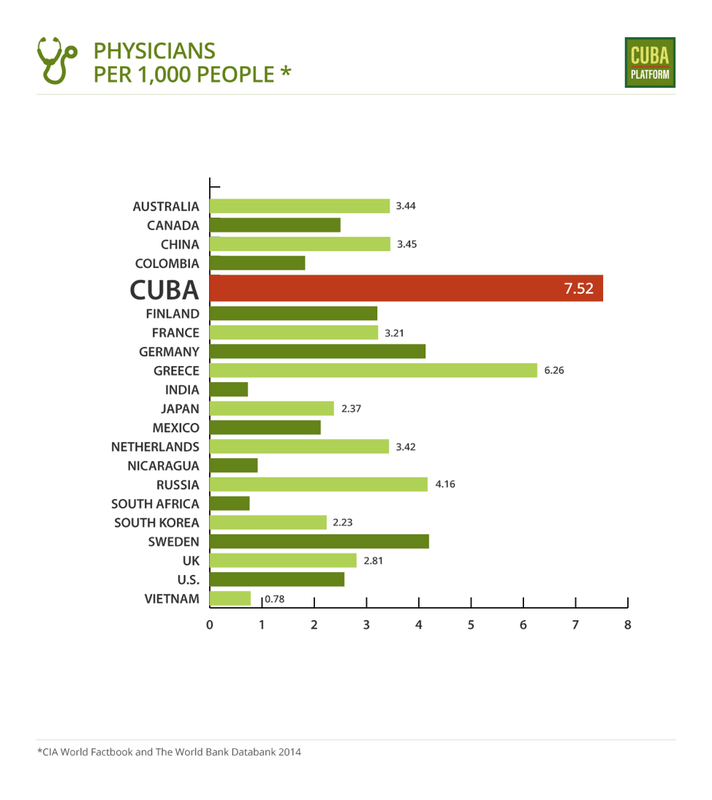 As seen in the figures, Cuba stacks up favorably against other countries in commonly used indicators of national health and development. It was also the first country in Latin America, in 2015, to gain WHO certification for eradicating mother-to-child transmissions of HIV and syphilis. Furthermore, with 7.52 doctors per Cuban citizen (according to the most recent 2014 statistics) it is the world leader in this measure. In 2016, according to figures from the World Bank, the infant mortality rate in Cuba was 4.2 deaths per 1000 live births. For the same year, this infant mortality rate is far below the WHO regional value given for Latin America and the Caribbean (14.88 deaths per 1000 live births), and compares favorably to that of European Union countries, at 3.45 deaths per 1000 live births. It is also lower than the value for the U.S., cited at 5.6 deaths per 1000 live births. For the same year, the World Bank reports that life expectancy rate in Cuba averaged 80 years, which compares well to the 75.4 years expected on average for Latin America and the Caribbean in that period. Like its infant mortality rate, Cuba’s life expectancy falls within the same range as that of many Western, developed countries: the regional average for European Union countries in 2016 was 80.62 years, and for the U.S., 78.69 years. Cuba has made its strength in and commitment to healthcare a pillar in its international relations as well. In 1960, Cuba sent its first international brigade of doctors to assist Chileans in the aftermath of a devastating earthquake, and since then, Cuba has sent over 130,000 medical personnel on aid missions to developing nations, primarily in the Global South. In 2004, Cuba launched Operation Miracle, in partnership with Venezuela, to dispatch Cuban doctors throughout Havana, Caracas, and the larger region of Latin America, in order to provide free ophthalmological surgeries to thousands in poor, underserved populations. In 2005, after Hurricane Katrina devastated the United States Gulf Coast, then-President Fidel Castro commissioned a new volunteer brigade, the “Henry Reeve Brigade,” to offer aid to the U.S. in the form of thousands of medical professionals trained in disaster response. President Bush did not accept the offer, but the brigade remained active. Since 2005, it has sent over 7,000 brigadiers to twenty-one countries, serving over 3.5 million people in response to various disasters such as hurricanes, epidemics and earthquakes. Henry Reeve brigadiers have assisted in disasters including the 2010 Port-au-Prince earthquake and the Ebola outbreaks of 2014. In addition to volunteer aid missions, Cuba also generates significant income through the exportation of medical services. According to the most recent available statistics, in 2014, Cuba generated an equivalent of $5 billion USD by contracting out Cuban doctors and other professionals to foreign governments, making healthcare Cuba’s highest-earning export. Cuban medical services also generate other resources and build politically strategic relationships: for instance, Venezuela has sent Cuba shipments of subsidized oil in exchange for various medical outreach initiatives. Finally, Cuba seeks to promote its model of public, preventative healthcare through the Latin American School of Medicine (ELAM). Founded in 1999, ELAM remains the largest medical school in the world. Since 2005, it has graduated tens of thousands of doctors from low-income communities in the Americas (including the U.S.), Africa, and Asia. [ix] Its mission is to recruit students from marginalized communities, train them as doctors, and send them back to serve their home communities. Today, non-communicable, chronic diseases constitute the main threats to health inside Cuba’s borders. Heart disease and cancer remain persistent problems, topping the list of the ten deadliest illnesses in Cuba. Other chronic, non-communicable diseases such as chronic lung disease, asthma, diabetes, and liver disease are also common. Due to ongoing economic insecurity and the challenges of importing medical supplies as well as raw materials for the domestic fabrication of medicines, certain common medicines remain in short supply, and healthcare facilities are not as comfortable or updated as many patients would prefer. Like many countries with improved healthcare and limited birth rates, Cuba is also facing the issue of an aging population. While only 11.3 percent of Cuba’s population was over 60 in 1985, that percent had risen to 20.3 in 2017. Cuba’s combination of low birth rates and low mortality rates has created a so-called “inverted pyramid” of age, with elderly populations rising and the number of children decreasing. The health problems of elderly Cubans, therefore, are now beginning to overshadow those of other sectors of the population, and Cuba is facing the challenge of providing care.